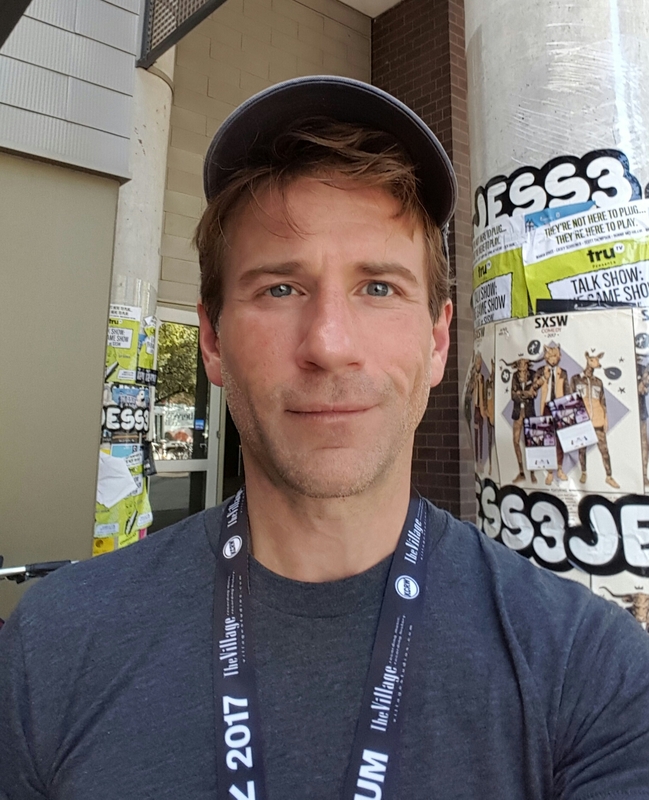 The annual tech festival South By Southwest Interactive is widely regarded as an indicator of things to come across industries, and journalism is no exception. As a matter of fact, this year’s edition of SXSW was the first to have a dedicated “Journalism” track. Like every year, dozens of media innovators and journalists descended upon Austin, turning the mecca for techies and creatives into a star-studded media gathering that included the New York Times’ Jim Rutenberg and Dean Baquet, former proprietor of Gawker Media Nick Denton, CNN’s Van Jones and Brian Stelter, Dan Rather, Recode’s Kara Swisher and many more. Of the 70 sessions in the journalism track, many were highly political, from the effect of filter bubbles and fake news on election outcomes, trolls’ role in the rise of anti-semitism online to President Trump’s antagonism towards the press. Other panels were about celebrity-driven headlines dominating the news cycle, the shifting role and responsibility of traditional media and redesigning online commenting. Here are three of the most timely journalism topics discussed at South By Southwest 2017. At a panel discussion about how technology can automate verification, four experts weighed in on the state of fact-checking, available tools, major limitations and what’s on the horizon: Alexios Mantzarlis of the the Poynter Institute’s International Fact-Checking Network, PolitiFact’s Bill Adair and Full Fact’s Mevan Babakar. At Duke University’s Reporters’ Lab, Adair helped create iCheck, a tool that automates the time-consuming process of checking claims about a candidate’s voting record. Adair was also instrumental in developing ClaimBuster, a software developed at the University of Texas at Arlington that sifts through massive amounts of text to find factual claims to fact-check. “When we tested it, we found a really strong correlation between what ClaimBuster showed and what human fact-checkers actually checked from a debate,” Adair said. Flowchart detailing ClaimBuster process. Image courtesy of Chengkai Li, associate professor of computer science at the University of Texas at Arlington. 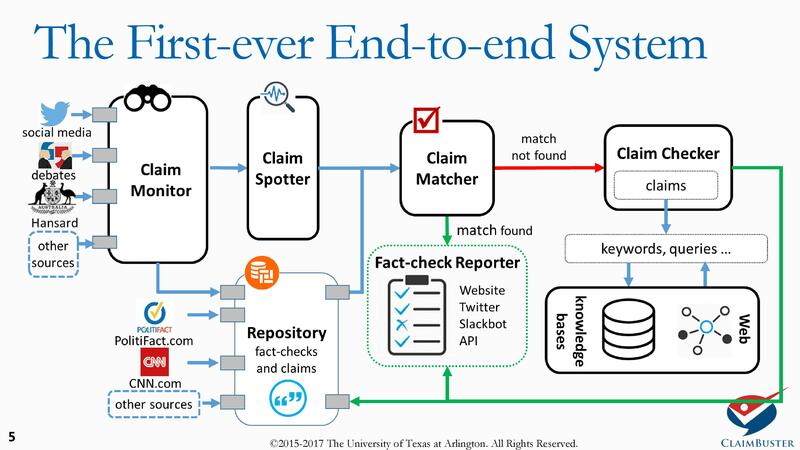 Unlike Poynter’s Mantzarlis, PolitiFact’s Adair is hopeful the automated and live verification of statements, such as instant “pop-up” fact-checking on live television, is only one to two years away. Since news organizations like the Associated Press started using automated news software in 2014, robot journalism has been a growing presence in many newsrooms. The Washington Post, for instance, last year launched “Heliograf,” its own automated storytelling system, to cover the 2016 Olympics and the U.S. presidential elections. “There is a lot of interest from our editors and reporters in how Heliograf … can remove rote and repetitive work,” Jeremy Gilbert, the Post’s director of strategic initiatives, told me over email. Heliograf would allow them to focus on “more interesting and valuable reporting,” he said. Another strength of automated news, according to Gilbert, is its ability to personalize and customize news. To that end, he said, the Post will launch “new tools” this year to both help their reporters “identify potential stories and personalize stories” for the Post’s audience. Joe Procopio, chief innovation officer at Automated Insights, a company producing software that helps publications like the AP generate data-based content, said personalized journalism is especially beneficial for local and hyperlocal news sites as well as blogger whose constituents have a particular interest in local news, from sports teams and traffic figures to education and crime. Joe Procopio, chief innovation officer at Automated Insights. Image courtesy of Procopio. Can automated news save local journalism? Although he doesn’t consider it a silver bullet, Procopio believes automated news can slow the demise of local news, both newspapers and online publications. “I believe it could allow the continuation of a smaller newsroom, for instance by providing more news to be able to fill a day,” he said. This, in turn, would make a publication “more full fledged” and help it attract more readers and local advertisers. Gilbert, on the other hand, is skeptical about automated news helping cash-strapped media outlets. “Automation is not a solution for all stories or a panacea for reduced newsroom resources,” he said, adding that it cannot replace human news judgement. “The machine is only as good as the journalists and technologists who power it. The world is not calling for a lot of simplistic, templated stories,” he said. Procopio agreed, saying that thanks to automated news, journalists don’t have to be “data scientists” to produce data-driven content. He also pointed out that once widespread concerns, including robots putting journalists out of work, have given way to “much more acceptance,” especially over the last three years. “Five years from now, automated news will be a standard part of the reporting process,” Procopio predicted. Two years ago, Periscope and Meerkat launched at SXSW. Since then, most big social sites have brought out their own solution for user-generated content livestreaming — Twitch IRL, Facebook Live and Instagram Stories have launched, Periscope is now integrated into Twitter and YouTube Live is continuing to evolve. In Austin, a panel of practitioners discussed the rapidly evolving live video space: Darian S. Harvin, editor and news curator at BuzzFeed, Deborah Acosta, interactive video journalist at the The New York Times, Mark Jones, head of digital content at the World Economic Forum, and Kay Meseberg, head of VR/360 at public Franco-German TV network ARTE. Here are the main takeaways. Jones said it’s the “social video dilemma:” For reach, 60-second videos with big captions work best, he said. Facebook Live is the better if you want interaction, although it tends to have lower reach and possibly even a “detrimental effect on your overall Facebook rating.” He admitted he doesn’t know how to achieve both reach and interaction. Meseberg gave one example for each scenario, both of which were live-streamed on Arte’s YouTube channel: the opening concert of Hamburg’s new philharmonic orchestra earlier this year as well as two electronic music performances during SXSW Music. Live-streaming events in multiple languages and/or with subtitles – Meseberg said Arte is not yet actively working with such tools because the “quality is not sufficient today.” One tool that already offers live translation, however, is Skype Translator. Correction: The last paragraph of this piece has been corrected to better reflect that Arte is not currently working in the live translation space.